Fireplace heating systems and wood burning boilers can power radiators throughout the home and produce domestic hot water thanks to appropriate kits. The fireplace heating systems and wood burning boilers can also be connected to an existing central heating plant. The fireplace heating systems and their coverings are ideal for anyone wanting to heat the home while using an object of design that elegantly furnishes all rooms, from modern to rustic to classical thanks to the many coverings available. While creating the atmosphere the fireplace heating systems offer high heating efficiency, savings of up to 40% on heating costs and lower emissions into the environment. They can also be used for cooking and can also function coupled to traditional gas boilers. The fireplace must e mounted with open vessel. The water in the radiators circuit heats up, circulating in the heat exchanger pipe (A) and in the gap (B) that brushes against the entire semi-circular wall of the firebox. The gap is realised with thick sheet steel. In the ignition phase, with vent open in order to ease the start of combustion, the combustion product gate valve (C) stays open in a way that the combustion products can reach the flue (D) directly and easily. 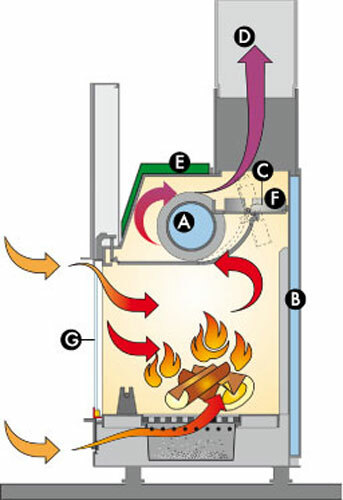 When combustion is taking place, by closing the door the combustion products gate valve (C) also automatically closes. 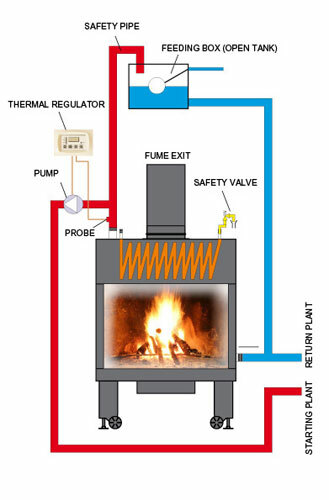 In this set-up, the combustion products are diverted before reaching the flue in a way to flow over and give up heat to the gap (B) and the heat exchanger pipe (A). • robotised welding procedure certified according to ISO 9001.